In this section, we explore the journal entries for bond issuances at par. Consider JJ Corp. receives authorization to issue $900,000 of 6%, 20 year bonds. The bonds are issued on January 1st, 2009 and become due on January 1st, 2029. They pay interest semi-annually each June 30th and December 31st. If the bonds are sold at par, here are the journal entries that JJ Corp. would make in its books. Entry to record the issuance of $900,000 par bonds at 6% yield & 20 year life term. On June 30th when it is time to make the interest payment, below is the journal entry. When the bond matures in 20 years, the company records the following journal entry to fulfill its repayment of the bond payable. Many bonds are issued on the date when interest is to be paid. This simplifies recordkeeping & administrative costs. However, when a company sells bonds at a date other than interest payment date, the purchasers of bonds are expected to pay the purchase price + any accrued interest since the prior interest payment date. This accrued interest is then repaid to bondholders by the issuing corporation on the next interest date. Entry to record issuance of bonds payable with 2 months of accrued interest collected. Entry to record interest payable semi-annually with 2 months’ of accrued interest. 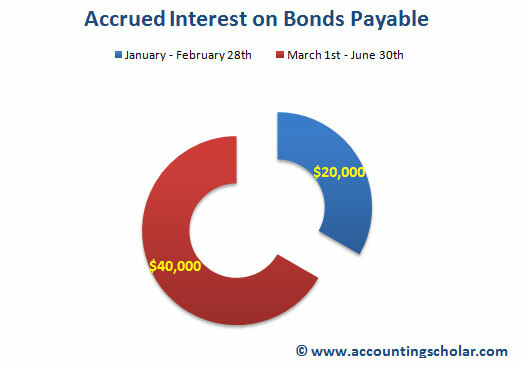 Above is a graph showing the breakdown of the $60,000 of interest payable to bondholders of which $20,000 is the collection of 2 months' interest when the bonds were sold and $40,000 is interest expense for 6 months starting from June 30th, 2009 to December 31st, 2009. This practice of collecting and then repaying accrued interest with the first interest payment is done to simplify recordkeeping & administration costs for the issuing company. Imagine a company the size of Sears Corp issuing 30 such bonds to different investors; obviously the cost of properly maintaining records for each of these bonds will become a hassle and very costly. If Sears Corp did not collect accrued interest from bondholders, it would need to pay 30 different cash amounts on interest payment dates to 30 different bond investments.